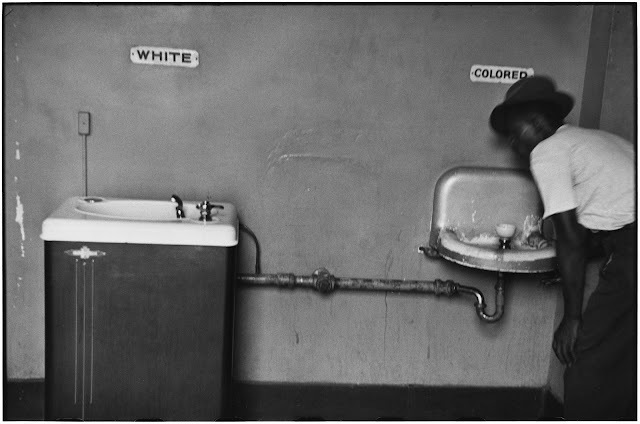 This photograph was taken by Elliot Erwitt in 1950 in North Carolina, USA, and represents the injustice of segregation of black and white people in America during this time. At the time the image was an example of how much things needed to change, now we see this photograph we can see how much times have changed and to reflect on the past. The interesting thing about this photograph is that we don’t necessarily need to know any background information. The photograph itself tells the story. The ‘white’ water fountain is visibly more luxurious than the ‘colored’. We can therefore see straight away that the image is simply evidence of controversial inequality. We can see on the man’s face him glancing almost longingly at the ‘white’ fountain. Discrimination in America took a turn for the worse after the Civil War and segregation was becoming increasingly apparent. When the U.S. joined WWII the southern society was fully segregated. Everything from schools, restaurants, hotels, train cars, waiting rooms, elevators, public bathrooms, colleges, hospitals, cemetery, swimming pools, drinking fountains, prisons, and even churches had separate areas for whites and blacks. The civil rights movement enforced legislations and organised efforts to abolish the segregation of African Americans and other ethnic minorities between 1954-1968, 4 years after Elliot Erwitt took this photograph.